Bluesound Pulse Flex 2i (available in black only) is a revolutionary, two-way speaker offering music enthusiasts the ultimate combination of performance and portability. Bluesound Generation 2i, builds on the success of the originals and continues to strengthen the range with dual-band Wi-Fi 5, Apple AirPlay 2 support, improved acoustics, new driver configurations complementing the upgraded amplification and more; All while maintaining value for consumers. Mount a pair in the corners of a large room or even take one with you on a picnic. With two you can have full stereo sound with a full sound field. The speaker connects to your Wi-Fi network so you have the ability to stream music anywhere in the home. Utilising Bluetooth AptX Technology means you can wirelessly stream in high-resolution from an app or from a Bluetooth enabled device. 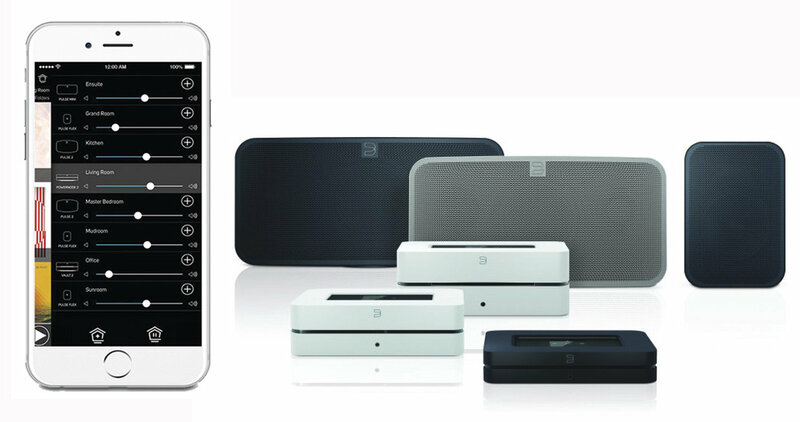 Communicating with Bluesound players is achieved by using the BluOS app to control the music played in every room. Bluetooth AptX reduces bit rate without an adverse effect on audio quality or introducing latency issues and, therefore, you can enjoy higher quality signals. You can group the speaker with other Bluesound Players around the home and create synchronous multiroom playback. Pulse Flex 2i utilises cutting-edge amplifiers paired with two custom full-range speaker drivers to deliver a deep, detailed sound. Every track you play goes through an advanced DSP processing each time you play for accurate studio quality sound without comprising quality for portability and size. Using the BluOS app with a smartphone or tablet (Android or Apple), you can easily control all of your music throughout the home from any smartphone, tablet, or laptop. Updating to BluOS 3.0, all BluOS users will gain access to new music services like SOUNDMACHINE and Taihe Music Zone (China only) and an easier guided set-up process. Plumbing for BluOS’s first voice integration, Amazon’s Alexa voice assistant will be included, with the corresponding library of skills to launch soon. BluOS 3.0 also contains specific support for Gen 2i features enhanced audio EQ settings including wide mode and deep bass. You can position the Pulse Flex 2i around your home and connect it to your WiFi room, or add the battery pack (sold separately) for streaming music whilst you are on the patio or in the garden with Bluetooth aptX. Once you charge the battery pack, you can listen for up to six hours without a power cable. Bluesound Pulse Flex 2i is designed to support AirPlay 2 (to be delivered to Gen 2i owners via upcoming software update). With AirPlay 2, you can stream just about any sound from iPhone, iPad, or Mac to your Bluesound system — all in sync. Stream music, books and podcasts from your favourite apps, or watch videos on any Apple device while streaming the audio through to this Gen 2i Player – imagine watching Netflix or YouTube on an iPad while filling the room with premium Bluesound audio. AirPlay 2 also gives users more options for control, including using Siri for voice assistance. Once you add your Gen 2i Player to the Apple Home App on your iPhone or iPad, Apple Music subscribers can use their iOS device or HomePod to say things like: “Hey Siri, play smooth jazz in the Living Room” or “Hey Siri, turn it up in the Kitchen.” By grouping a Gen 2i Player with older Bluesound Players in the BluOS App, existing customers can add AirPlay 2 compatibility to their entire BluOS system. Bluesound has upgraded the Wi-Fi chipset technology to the latest and greatest Wi-Fi 5 (802.11ac) dual-band offering. This allows you to take advantage of the less noisy 5 GHz band if needed resulting in faster connection times and fewer interruptions from other network traffic.